With numerous beaches, fifteen of which are awarded with the prestigious Blue Flag given to high quality beaches, it's no wonder Krk island is one of the most sought after tourist destinations in Croatia. Beside being one Croatia's sunniest islands (Krk has around 2 500 sunny hours), it's also Croatia's biggest island. That means you'll definitely find your beach of choice – from kid and pet friendly beaches to naturist ones. But if you're still undecisive, read on and find out which are, according to us, the 5 best beaches of Krk island. 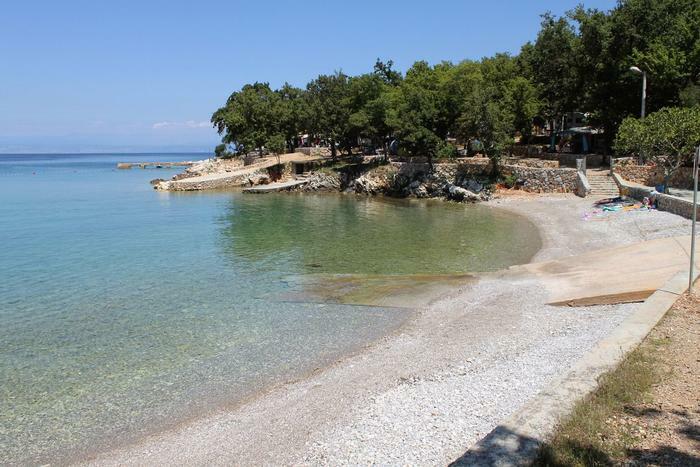 Book an apartment or room on Krk and discover these magical beaches on your summer vacation. 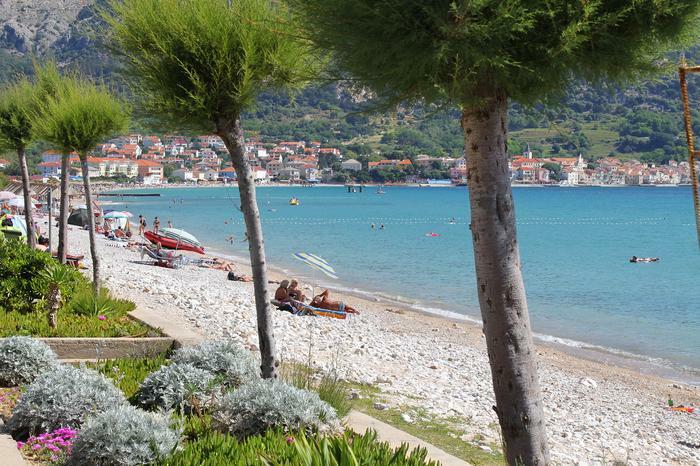 The first beach on our list is the Vela Plaža (Great Beach) in Baška town. Just like its name implies, this is a big beach. It stretches over 1 800 meters. Because of its accessible location (it's located in Baška's centre), but also because of its beauty, Vela Plaža is one of the most popular beaches on Krk. However, in peak season it can get a bit crowdy. 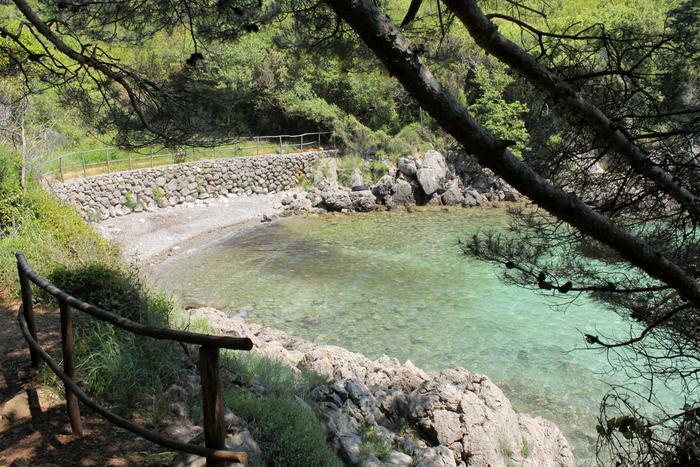 But still, it's ideal for families with children because of its long shoal and tiny pebbles. There is a caffe and restaurants that offer guests a time out from being in the sun and in the sea for too long. Vela Plaža doesn't have a shade, so make sure you bring your parasol or if you don't have one – no worries, you can rent one on the beach. This secluded beach with fine shingle surrounded by majestic hills is 6 kilometers away from town Baška. The only way to get there is by hiking through a footpath along which you can see curious sheep; or by a taxi boat that travels every day from Baška. Vela Luka has a restaurant and you can rent out parasols and deckchairs. Because of it's untouched surroundings and beauty it was named the most romantic beach in Croatia back in 2015. We advise against going through the mountain trail during hot summer months. But, considering Krk is one of the sunniest islands in Croatia, bathing season lasts until October, so you can reserve your mountain adventure for autumn or summer. 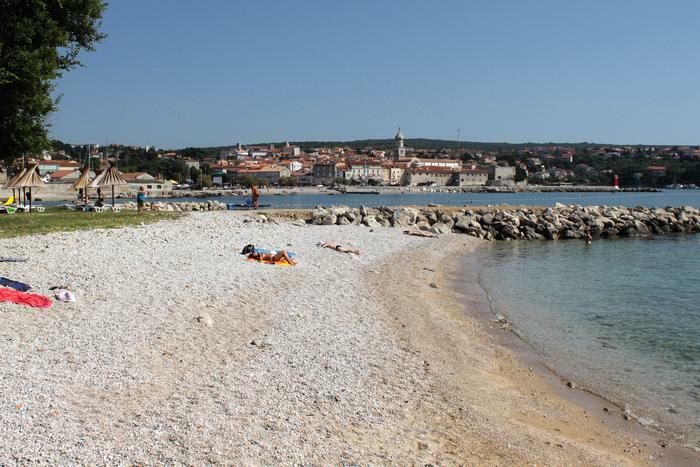 Of seven pet – friendly beaches on Krk, our choice is the sandy beach of Redagara in Krk, east from Koralj Hotel. The surrounding forest gives a large shade, and there's also a shower. The beach is secluded so your pet can enjoy the sea without any disturbance. Book a pet - friendly accommodation on Krk. 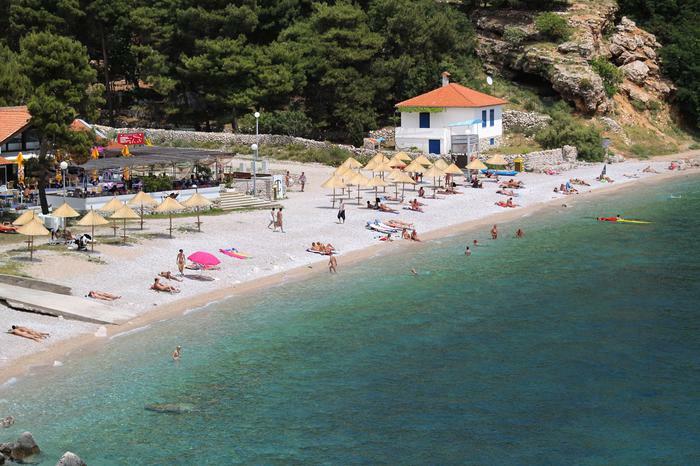 It takes just five minutes by foot from Krk city centre to the Porporela beach awarded with a Blue Flag. Porporela beach is located near the Ježevac camp. One part of this fine shingle beach is cemented, and there's also an entrance for the disabled. Don't worry if you forget to bring your parasol. You can rent one together with a deckchair on the beach. Porporela is also ideal for families with children. While you're taking a break, refresh yourself in a nearby restaurant or caffe. 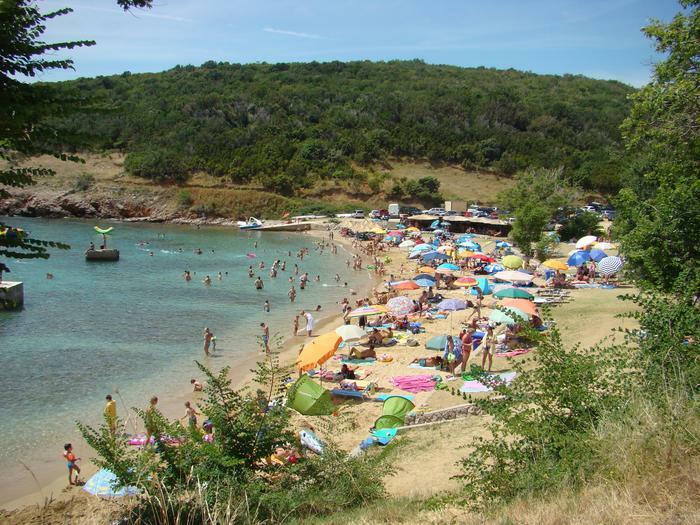 Halfway between Vrbnik and Silo, in the village of Risika is the location of the sandy beach st. Marek. You can get there by car and even park on a parkinglot just beside the beach. There's no shade, so bring or rent out your parasols. This secluded, romantic beach is a perfect choice for all of you wishing for a peaceful spot on your summer vacation on Krk.